Product Description: This is a set of polished aluminum door handles. Included are rigid wire connectors and adjustments between the door handle and the bear claw door latches. The connectors must be adjusted correctly. Too short of a connector will make the door handle move further to open the door. Too long of a connector will create the possibility that the doors may open unexpectedly if the car goes over a bump or drives over uneven pavement. Product Description: This product includes five sets of contact switches (see arrow) that allow electric circuits to flow through the door jamb when the door is closed. These switches are spring loaded, wire connectors. Mounting holes are also included. Up to five electrical circuits can be connected through these contact switches. Examples include electric windows, electric solenoids for shave door kits, ground, electrical turn signals in side mirrors, and electric door locks. When installing the switches in the door and door jamb, make sure the buttons are exactly matched or lined up with each other to make effective electrical contact. Product Description: This is a teardrop style side mirror, with a hidden mounting, LED blinker light. See arrow. The base and frame is fully sandable and paintable. Although the mirror inside the housing does have a good amount of adjustment, it is important to sit in the street rod and have another person hold and mark the best position of the mirror. If the mirror sits too high because of the angle of the door surface, the base can be sanded on one side to get the correct position. The wires for the turn signal go through the base and into the inside of the door. Two bolts hold the mirror in place from the inside. Product Description: This shaved door kit is installed inside the street rod door and used to open the doors without having outside handles on the door. The kit includes two solenoids, mounting hardware, two remote transmitters with four buttons each, a seven channel receiver, and electrical wires. As shown in the photo to the left, when the solenoid is energized, its center plunger moves down. See arrow. This movement is connected with a wire to the door lever or latch mechanism. When the lever is moved down, the bear claw latch is opened and the door opens up. With the use of the four button transmitter and the receiver, one button can open the driver's side door. A second button can open the passenger side door. At this point, only two of the seven channel receiver have been used. 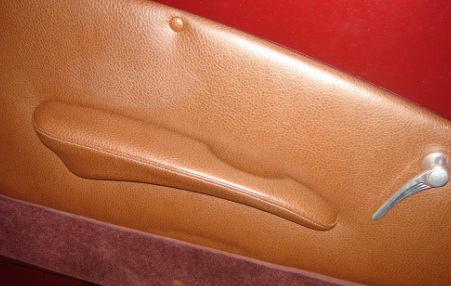 Product Description: There are many types and shapes of arm rests The one shown in the photo to the left was purchased because it had an indentation where the door could be closed by pulling from the inside. It also had a visual appeal that matched the inside of the door design. After purchasing, the arm rest was taken to an upholstry shop to have it covered. Its position on the door is somewhat important. Before attaching it should be tried in several positions with the driver in the vehicle, until the best position is found and marked accordingly.